This recipe doesn’t exactly match up between the three books. Lommebogen has Doctor Special, while Cafe Royal and Savoy have Doctor, without the “Special.” They are obviously closely related though because they both use an ingredient called Swedish Punch (also called Caloric Punch), so I went ahead and added it to my list. Looks like the “special” part is adding gin. I can’t argue with that. Swedish Punch is a liqueur with a base of arrack, which is a liquor from Asia. Before I mixed it, of course, I tasted a bit straight up, and I have to say it’s pretty easy drinking, if not so interesting. It’s light and sweet, without a strong identifiable flavor profile. The bottle says things like honey, vanilla, etc. (Note that I’m drinking a Danish brand from Taster Wine, so who knows how that compares to some of the more classic Swedish brands.) I tried it next to some Galliano (a vanilla liqueur) and I’d say that the Galliano tasted a bit sweeter, and has a little more vanilla flavor to it, but at least you’re in the same ballpark, with a kind of general sweetness. Good for mixing into just about anything I’d say. 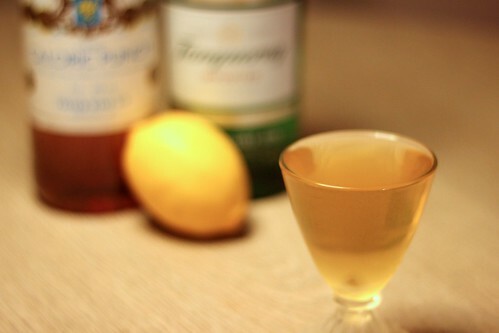 When I made the Lommebogen drink, my first thought was sweet gin. And not in an Old Tom Gin way, or even a Sloe Gin way. I like both Caloric and gin, but I’m not sold on them together like this. It isn’t a bad drink, per se, but definitely something about it that gave me a bit of “hmmm.” The gin and the punch needed another element to tie them together. You know, like more lemon or lime juice. I found the regular Doctor cocktail with more lemon juice to be quite tasty. I decided to go ahead and try to combine the two recipes to make a nicer Doctor Special. I ended up trying it out with a little less gin and some more lemon juice. It was a nice balance, and overall a nicer drink than Axel’s.